During October and November, 2016, Challenger has been making appearances in many stadiums and convention centers throughout the United States. Traditionally in the Fall, all the Eagles that live in the aviary on Eagle Mountain Sanctuary at Dollywood are gathered up for their annual physicals. 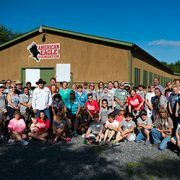 An eagle release, outreach, and grand openings added to a busy Fall 2016 schedule for AEF. On August 11th, the American Eagle Foundation (AEF) reintroduced an adult Bald Eagle back into the wild after months of rehabilitation. The AEF named the eagle “Summitt” in honor of and in memory of former Lady Vols Coach, Pat Summitt. Challenger wrapped up 2015 with a momentous and impressive flight on New Years Eve at the Cotton Bowl in Dallas, Texas. After a month of rest, we embarked upon another busy travel season, flying and driving all over the country with Challenger and a couple other of our Bald Eagles to educate the public and inspire them to preserve this majestic species. AEF Releases Its 150th Eaglet! Five Eaglets Set Free in 2016. This was a monumental summer for the AEF, we released 5 more captive-hatched and translocated eaglets into the wild…with our last release of the summer marking our 150th eaglet set free into the wild from our Douglas Lake “Hack Tower” in East Tennessee! On Friday morning, June 24th, the non-profit American Eagle Foundation (AEF) released a 13-week-old Bald Eaglet named “Hope” (patagial tag “H6”) into the wild to remember and honor the 49 victims who were recently killed in the Orlando mass shooting on June 12th, 2016. 2016 Chatter Reunion & American Eagle Day Celebration a Big Success! 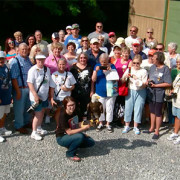 Our 3rd Annual Chatter Reunion was held June 16-18 at Pigeon Forge, TN. 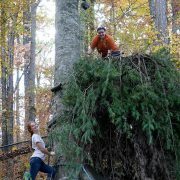 Chatters, Moderators, and Cam Operators came from all over the United States and even Canada [ 16 states plus Canada ] to experience and celebrate what the American Eagle Foundation stands for, and to join with other Kindred Spirits for fun and fellowship. 11.5-Week-Old Eagle “Liberty” Fledges the Nest LIVE on the DC Eagle Cam! 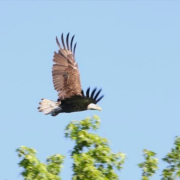 The male eagle “Liberty” at the National Arboretum fledged from his nest tree at 6:12 am on June 9th. 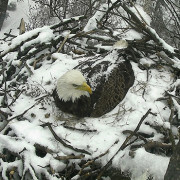 The sale of nearly 6000 Limited-Edition DC Eagle Cam T-shirts has assisted in keeping the DC Eagle Cam running successfully. 11-Week-Old Eagle “Freedom” Fledges the Nest LIVE on the DC Eagle Cam! 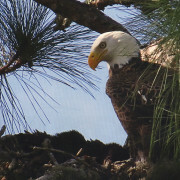 On June 5th, around 2:30pm EST, “Freedom,” one of the two young eagles residing in the nest of “Mr. 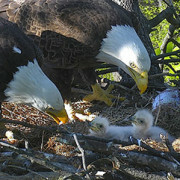 President” and “The First Lady” in the U.S. National Arboretum, fledged the nest! Millions of race fans from around the world got a very brief glimpse of the celebrity Bald Eagle “Challenger” as he soared over Turn One at Indianapolis Motor Speedway during the singing of God Bless America (Indianapolis Children’s Choir) before the start of the Indy 500’s 100th Running race on Memorial Day Weekend. It’s almost time for parent eagles “Mr. President” and “The First Lady” to say goodbye to “Freedom” and “Liberty,” the now not-so-little eagles residing inside a bald eagle nest at the U.S. National Arboretum in Washington, D.C.
DC Eagle Cam Eaglets Now Have New Names! DC2 & DC3, the two adorable Bald Eaglets watched daily by hundreds of thousands of viewers on www.dceaglecam.org, now have new names! This past week, five of the most popular name pairs that were suggested via the “Name the Nestlings” social media campaign were put to a final public vote. More than 36,000 people voted. The winning names? “Name the Nestlings” Ballot Is Open! 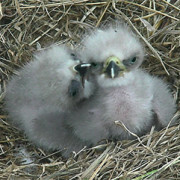 Vote Now to Help Name DC Eagle Cam Eaglets! Nest cam fans from around the world recently participated in a “Name the Nestlings” social media campaign to suggest names for “DC2” and “DC3” the two eaglets currently residing in the U.S. National Arboretum in Washington, D.C. Thousands of names were submitted via the hashtag campaign, and now five of the most popular suggested name pairs and are being put to a final public vote! Millions of people were glued to their computers and mobile devices this week watching dceaglecam.eagles.org and waiting for the eggs of ‘Mr. President’ & ‘The First Lady’ to hatch LIVE on the Washington D.C. Eagle Nest Cam. 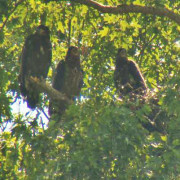 The American Eagle Foundation (AEF) and the cooperative partners of the project are proud to announce that there are now two healthy eaglets residing in the nest that sits high in a Tulip Poplar tree in the U.S. National Arboretum, right inside the Nation’s Capitol. Crystal Slusher is behind the zooms and pans you see when you watch Bald Eagles nesting and hatching chicks online. 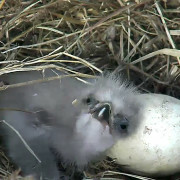 “Breaking” News: First Bald Eaglet Begins to Hatch from Egg LIVE on D.C. Eagle Cam! 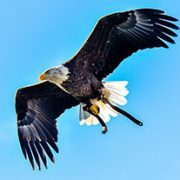 Since mid-February, hundreds of thousands of viewers have tuned into dceaglecam.eagles.org to watch two live-streaming, high definition cameras featuring the wild nest of Bald Eagles “Mr. President” & “The First Lady.” These parents have been faithfully incubating two eggs at the top of a Tulip Poplar tree in the U.S. National Arboretum, right inside the Nation’s Capitol. Their devoted attention and dedicated efforts finally began to pay off last night, as the first eaglet began its “pipping” process! “Pipping” occurs when an eaglet uses the tip of its beak to break through the internal membrane and the outer shell of its egg. Eagle Eggs Due to Hatch Soon on D.C. Eagle Nest Cam! 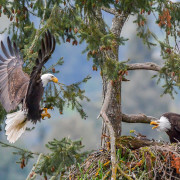 The tens of thousands of viewers who have become addicted to watching Bald Eagles “Mr. President” & “The First Lady” on the D.C. Eagle Nest Cam (dceaglecam.org) may want to keep their eyes glued to their computer screens this week to hopefully see two fuzzy eaglets hatch from their eggs. Viewers from all over the world can now watch the nest of “Mr. President” and “The First Lady,” a pair of Bald Eagles nesting in Washington DC at the U.S. National Arboretum. he American Eagle Foundation is once again proud to announce next year’s successful eagle grants applicants. 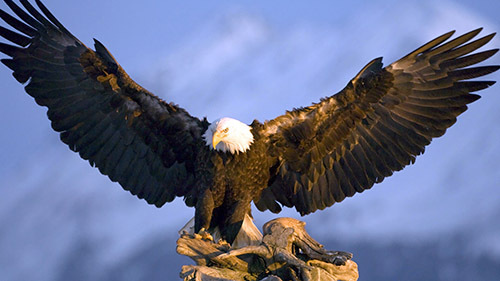 For 2016, seven applicants for American Eagle Foundation grants were selected to receive in $100,251 in funding for work to be carried out in 2016. The American Eagle Foundation has earned its third consecutive 4-star rating from Charity Navigator, recognized as the leading charity evaluator in America..
On Sunday December 13th, Christmas at the Smoky Mountain Opry hosted an exclusive Holiday Benefit Show featuring American Idol’s Clark Beckham (season 14 runner-up), singer/songwriter James Rogers, and the famous free-flying Bald Eagle Challenger. 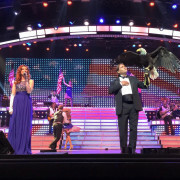 The benefit show celebrated the American Eagle Foundation’s (AEF) 30th anniversary and raised more than $38,000 to help care for and Protect America’s Eagles®. Florida has 1,340 nesting territories (based on 2008-2009 nesting season data) and is home to more nesting pairs than any other state, except Alaska and Minnesota. Take a minute to give thanks for the years of work the late Bob Hatcher did in coordinating efforts by state and federal agencies and private entrepreneurs to return the national symbolic bird to Tennessee. 2015 marks Challenger’s 20th Anniversary free-flying at various sporting events, conventions, and trade shows around the country! Check out what Challenger has been up to during the Fall of 2015! 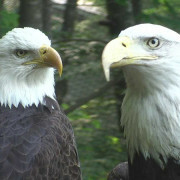 Wild Bald Eagles ‘Romeo’ & ‘Juliet’ hatch first egg / eaglet in time for Christmas, exciting viewers worldwide! 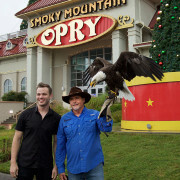 On Sunday December 13th at 8 p.m., Christmas at the Smoky Mountain Opry will host an exclusive Holiday Benefit Show featuring American Idol’s Clark Beckham, singer/songwriter James Rogers, and the famous free-flying Bald Eagle Challenger. VIP Tickets are selling for $125 (100% of VIP ticket proceeds support the non-profit AEF and can be claimed as a tax-deductible donation). 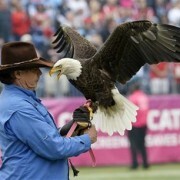 Before Challenger soars around the stadium for his stirring portion of the pregame routine, the Bald Eagle takes the same trip upstairs as many fans heading to the upper deck. He rides the elevator. For nearly 15 years, the AEF has been releasing captive-bred and translocated Eaglets in the foothills of the Great Smoky Mountains from its Hack Tower on Douglas Lake. In 2015, we experienced yet another successful breeding and hacking season with the release of 10 young Bald Eaglets! 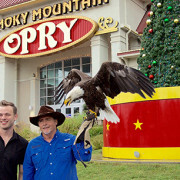 American Idol runner-up Clark Beckham, American Eagle Foundation President Al Cecere, and celebrity educational Bald Eagle ‘Challenger’ meet at the Smoky Mountain Opry Theater in Pigeon Forge to promote a special December 13th benefit show supporting the non-profit eagle care and protection charity. 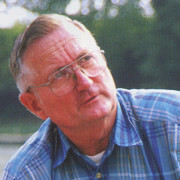 The partnership between the American Eagle Foundation and Field & Stream began in the summer of 2013. 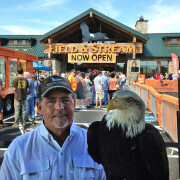 Through the end of 2015, the AEF has participated in the Grand Openings of 17 Field & Stream stores, accompanied by Bald Eagles Challenger, Mr. Lincoln, and Spirit. The famous educational ambassador Bald Eagle ‘Challenger’ revisited Ground Zero in NYC during 2015. 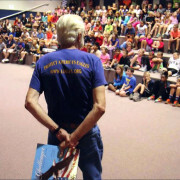 Around 225 Lincoln Elementary School students could not contain their excitement Thursday afternoon when learning about eagles from an American Eagle Foundation moderator that some interacted with through web-based class lessons. Both Dollywood and AEF are celebrating their 30th anniversaries this year, and it turns out that these disabled Bald Eagle parents, named ‘Independence’ and ‘Franklin,’ are raising their 30th eaglet. Each year, Bill and Tani Austin of the Starkey Foundation, hold a gala in St. Paul Minnesota to raise money for their hearing foundation. 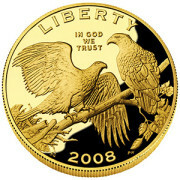 Tables are “purchased” at different prices by individuals, groups, or companies. In addition, both a silent auction and a live auction are held, raising additional funds, which are used by Starkey to fund their mission. As June 18 approached, signaling another AEF Reunion combined with American Eagle Day, excitement built to over-the-top levels! Emails and Facebook posts lit up the Internet – filled with anticipation as to what these three days would bring. Finally, everyone participating in Reunion had arrived! Reservations for the Reunion topped out at 100, with more on the waiting list. An Eagle released into the wild by the American Eagle Foundation back in 2008, is now back home to start her own family. On behalf of Charity Navigator, I wish to congratulate American Eagle Foundation on achieving our coveted 4-star rating for sound fiscal management and commitment to accountability and transparency. New York City Audubon confirmed that a pair of bald eagles are nesting on the South Shore of Staten Island, the first such touchdown in the city in 100 years. Non-releasable Bald Eagles Independence and Franklin live in an enormous aviary at Dollywood on AEF’s Eagle Mountain Sanctuary. Since 2002, they have successfully raised 29 eaglets that have been released into the wild. 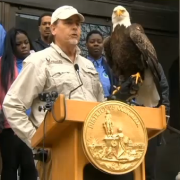 Washington D.C. is joining the effort to establish a national American Eagle day.